Windows operating systems provides some mechanism to share the resources between different systems. One of the most known and popular tool to manage these resources is net command whit related sub command. In this tutorial we will look how to create, mount, remove and manage network shares with net use and net share command. We will use following syntax for net use. Help about net use command can be get with the following command. We will create a share which maps to the C:\cygwin64 folder. We will also set the network share name as myshare with the following command. We will provide the share name and the path like below. We have successfully created the share named myshare . If we have do not have permission for given mapped shared directory we will get error and the share will not created. Existing shares can be listed with net share command without providing any parameter. This will list current host network shares. Remark is comments and notes about this share which is set while share creation. LEARN MORE How To Mount NFS Share In Linux and Windows? We have created and listed shares in previous mount shares are easy as creating them. 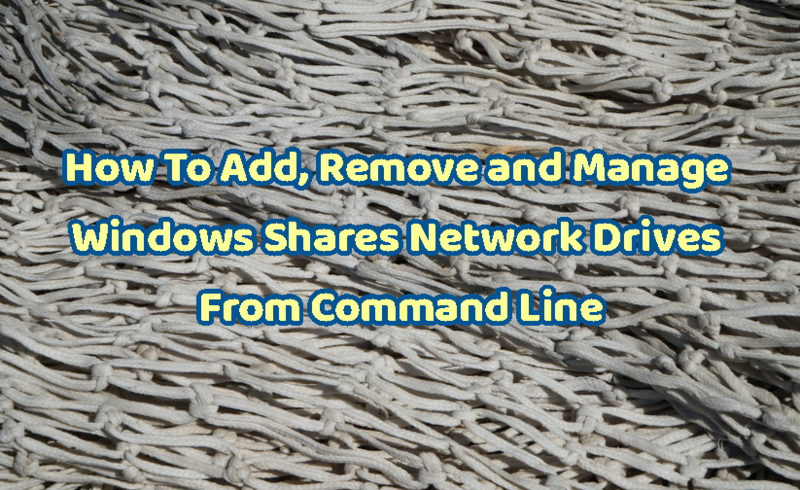 We will use net use command to mount a windows share from command line. We will mount share named myshare located at 192.168.122.167 to our drive z: . We have successfully mounted the share. While mounting user credentials should be provided. but in this example the share was created with the same user who mounts the share. So we have all ready have permission access to the share. We have mounted the remote file share in the previous example. We can list all ready mounted shares simply using net use command like below. Listing shares will provide information like below. Network shows network used to access share. We can unmount a share similar like mounting it. We will provide /delete option to the mount command like below. In the example we will unmount the remote share name \\192.168.122.167\myshare from our local system. We can stop sharing previously shared resource with the /delete parameter and the share name. In this example we will stop sharing myshare . Alternative way to remove a share is providing the physical location of the shares. This will delete related share and share name. In this example we will provide physical location as c:\cygwin64 to remove related share. LEARN MORE What is SMB Port and Port Number? Which Protocol Uses Port 445 and Port 139 ? In previous example we have removed existing share from local computer. We can also remove remote systems share by specifying remote system IP address or host name. In this example we will remove share from 192.168.122.66 with the following command. While creating network shares the access permission is important factor for security reasons. We must set which users accounts can access to the share with which access rights. This can be set with /GRANT option and specifying user and rights. Syntax of grant options is like below. In this example we will give user account john full access which means READ , WRITE and EXECUTE permissions for the given share. How To Start Applications From Command Line In Windows Different Ways?